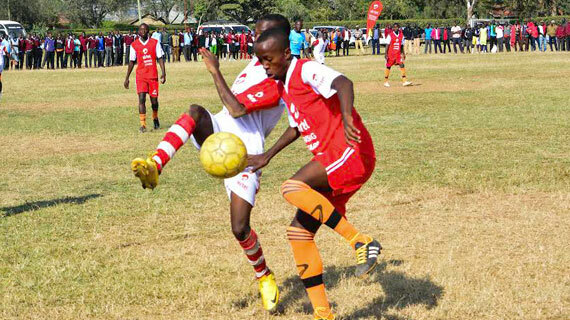 Kajiado’s Laiser Hill successfully defended their Airtel Rising Stars Metropolitan region title after a hard earned win over Kibera’s Olympic High School in a final played at the Upper Hill High School Ground on Saturday evening. Laiser who had earlier on beaten arch rivals Upper Hill High School 5-3 on penalties in the semi-final were one up just two minutes into the game from a rasping Julius Oketch long range shot from a Richard Odanda pass. Harambee Stars under-20 winger Musa Masika who has been instrumental in Laiser’s campaign came close in the 16th minute, racing on the left past his markers to lay in a cross but Odanda’s effort from the header went wild. Oketch then doubled his and Laiser’s tally in the 37th minute with a neat finish from a wel worked move. In the second half, Olympic who had lost 2-0 to Laiser in the preliminaries came back a rejuvenated side and made tactical changes to their side that changed the tempo of the game. The pressure only yielded fruit five minutes to the final whistle when skipper Shawn Odhiambo halved the deficit, but Olympic’s hope of a late fight back were thwarted by a disciplined Laiser defense. Laiser Hill had earlier reached the Airtel Rising Stars Metropolitan Region final with a 5-3 post match penalty win over Upper Hill after the two sides had tied 1-1 in regulation and extra time time. Upper Hill took the lead through Washington Odoyo’s headed goal on 22mins but Laiser responded with a 77th min equalizer from Chris Owino. Barding and Nyakach will fly the region’s flag at the national finals after winning their final matches on Saturday. Barding posted a 3-1 win over Usenge to win the boys final while Nyakach Girls edged out Singo Girls 1-0 to win the girls title. Green Palms and St. Johns Kaloleni booked their tickets from this region in convincing style. Green Palms were 3-0 winners over Shimba Hills in the boys final while the Mwanahalima Adam inspired St. John’s made a mockery of Kwale Girls, plundering seven unanswered goals past their opponents, Adam bagging five with Liz Katungwa and Nuru Adana adding the other goals.